*Class and event fees will be credited to future membership when joining FABA within 60 days of event. 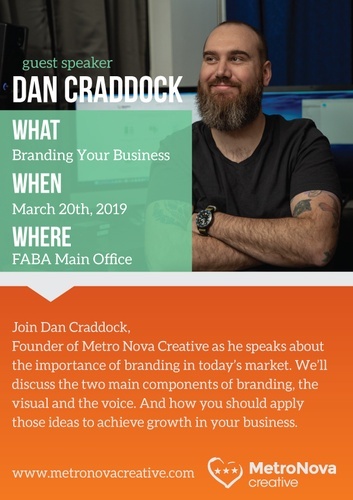 Join Dan Craddock, founder of Metro Nova Creative as he speaks about the importance of branding in today’s market. We’ll discuss the two main components of branding, the visual and the voice. And how you should apply those ideas to achieve growth in your business. About Dan Craddock, Creative Director, MetroNova Creative - Dan has nearly two decades of experience in the design and branding industry. He attended the Art Institute of Washington and studied Graphic Design before stepping away to focus on developing a client base on his own while learning how to appropriately manage projects for clients all over Northern Virginia and Washington D.C.. He spent years working as a production designer in print and sign shops while carving out his place as a logo designer and brand specialist in the freelance world. During this time he began finalizing the plan to launch Metro Nova Creative, a brand development company that helps businesses grow with strong design, and marketing services. He works with clients all over the country, and looks forward to learning more about your business and your goals!